TIMELY , was founded in 2003 Copenhagen, Denmark when the founder Derek inspired by his Doxin began crafting high quality and functional leather dog supplies from the basement of his home. It took Derek years to find leather and create products that were good enough. By good enough he meant clean and free of chemicals, created for the pets' well being and without harming the environment in the process. Derek's dedication to the wellbeing of Pets, People and Planet showed in all aspects of his business. Derek would bring his hand made products in his van to small boutiques in the Copenhagen area and was slowly growing his business throughout Denmark. The business grew to cover several countries in Europe with the main focus on Scandinavia. Recently, Anita his sister joined him to bring the products to the American market under the brand HUND Denmark by TIMELY LLC. Anita has for many years been a huge fan of her brothers’ products. She has been using them on her own two Coton De Tulairs (Ivy and Babbs) to prevent hair matting and skin irritation. After Anita graduated with a Masters in Business Management, she saw a perfect opportunity to pursue her passion and joining her brother. Anita lives in the Dallas area and is highly passionate about brining TIMELY products to the American market for all dogs and their owners to enjoy for many many years to come. TIMELY's Leather has been awarded the Eco Friendly German Certificate for protecting the Environment and Health, Climate, Resources and Water. HUND Denmark by TIMELY LLC, is the company structure in America while the company structure on the European Market is Sole Proprietorship registered under the brand name TIMELY. Who doesn’t love the look and feel of leather? Appearances aside, it also holds up amazingly over time. We have been using a leather dog collar and leash for several years now and they both still look like the day we got them. Our only hesitation in buying more leather accessories is the environmental impact of leather production. In case you are not aware, the tanning process utilizes many harsh chemicals which can pollute the environment and leftover residue on finished goods can be harmful to people and pets. HUND Denmark is a family owned company specializing in hand crafted leather goods. Not only are they known for their high quality and unique styles, but also their commitment to environmentally friendly products. What began as a basement operation in 2003 selling in small boutiques in and around Copenhagen, has now grown across Scandinavia. At this point, they are looking to expand into the American market and reached out to us to help spread the word! HUND was kind enough to send over 2 of their best selling products for our resident experts to test out. They are also sponsoring a giveaway so make sure to read our review through to the end to see how you can win your own! Being an animal byproduct itself, leather is chemically similar to a dogs own skin – making it a natural choice for dog accessories. 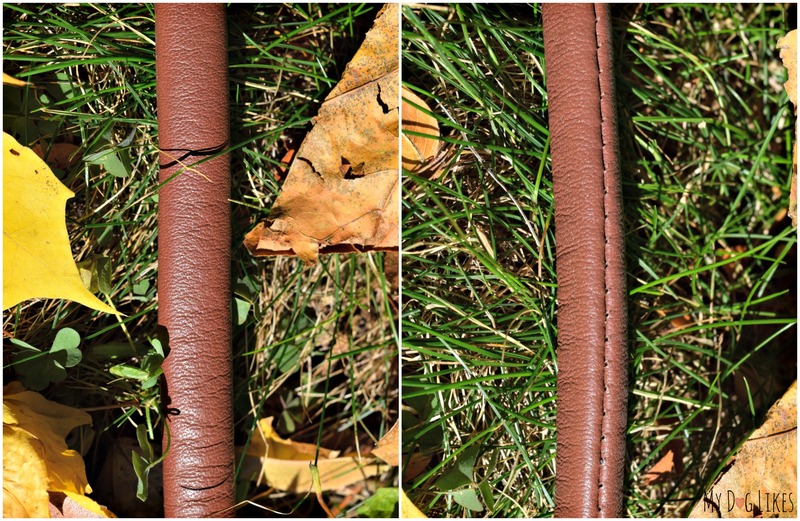 Leather is also long lasting while at the same time being completely biodegradable over time. What makes HUND’s leather so special? Nearly 90% of the leather on the market today is processed using harsh chemicals. HUND on the other hand uses only vegetable tanned leather sourced from centuries old Italian tanneries. This is an environmentally friendly process – dying the leather with natural tannin’s from plants such as the chestnut or quebracho tree. 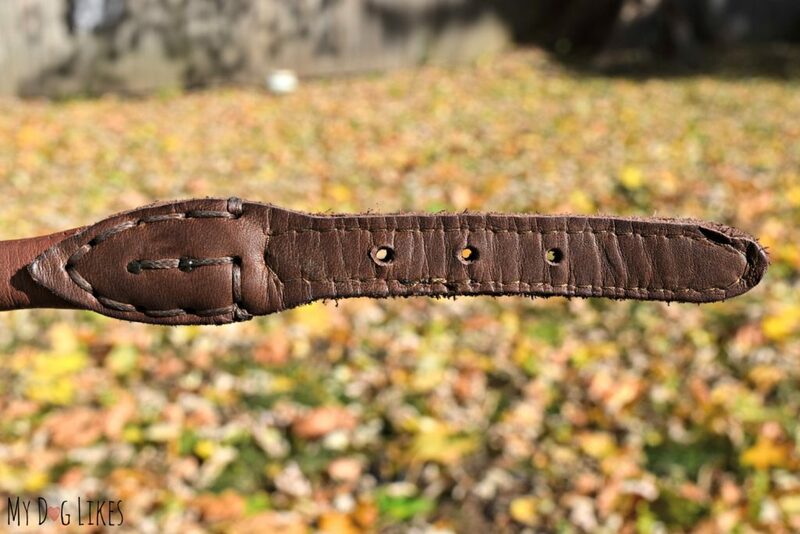 Although it takes nearly 20X longer to prepare the leather than newer, more abrasive methods, HUND feels that the added time and cost is well worth the reduced environmental impact. We couldn’t agree more! Regular readers will know how important safe and environmentally friendly products are to us. 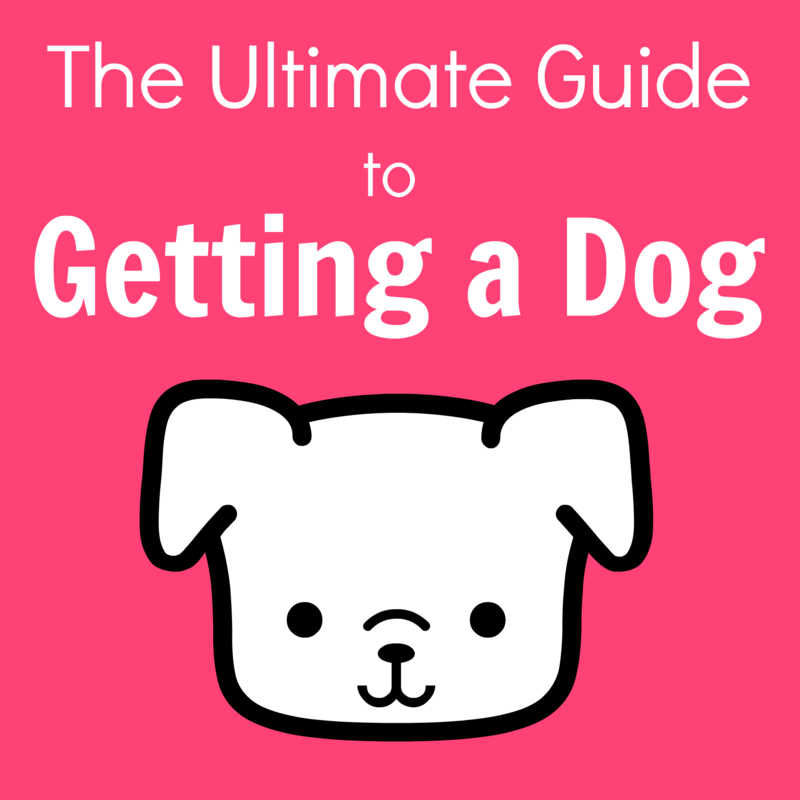 Our dogs are a part of the family and we only want the best for them. We applaud companies like HUND who are willing to stick to their principles as opposed to going for a higher profit margin. HUND’s commitment to the environment has paid off, earning them the coveted Blue Angel Certification signifying excellence in eco-awareness across their products entire lifecycle. This is a rigorous certification involving routine inspections and continuous improvement. 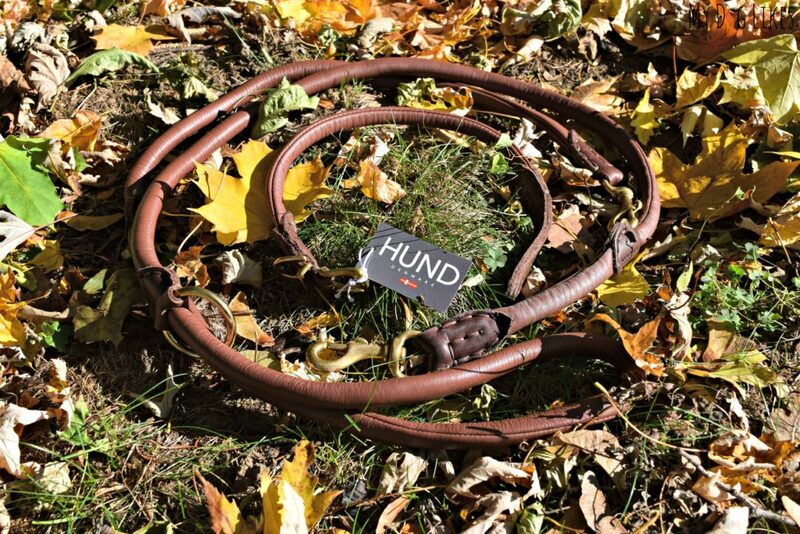 HUND offers a wide variety of dog gear and accessories from collars and leashes to harnesses and accent pieces. We are going to be highlighting 2 of their most popular products to give you an idea of how they stack up in terms of quality and functionality. Their products are available in a wide variety of colors including brown, blue, black, pink, red and cream – all colorants have been naturally derived from plants as well! 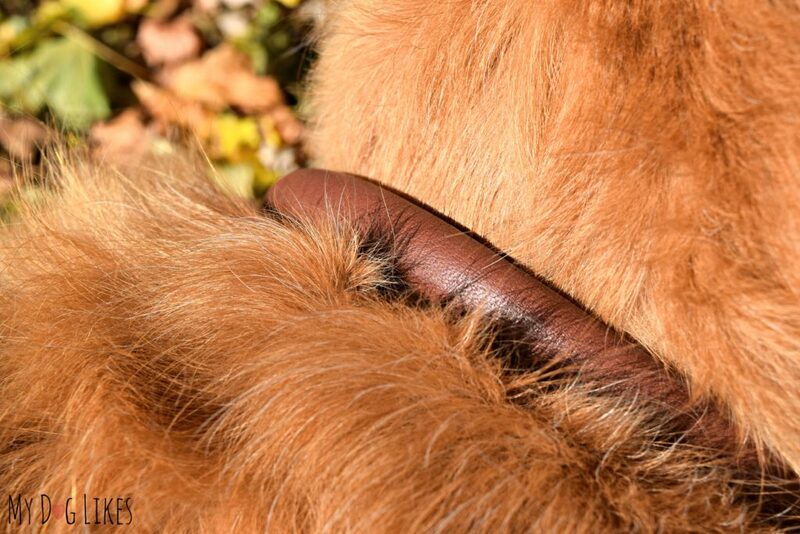 Most leather (and non-leather) collars on the market are what are known as “flat collars.” These designs can cause pulling/breaking of hair and even lead to painful matting. This is especially likely with certain types of hair – with our boys Golden coats among them. Round collars on the other hand are able to roll over the dogs fur without causing these issues. HUND’s collars take this a step further with a unique interior stitched seam along the main length of the collar. With nothing for the hair to get stuck on, this will make for a truly comfortable experience for your dog. 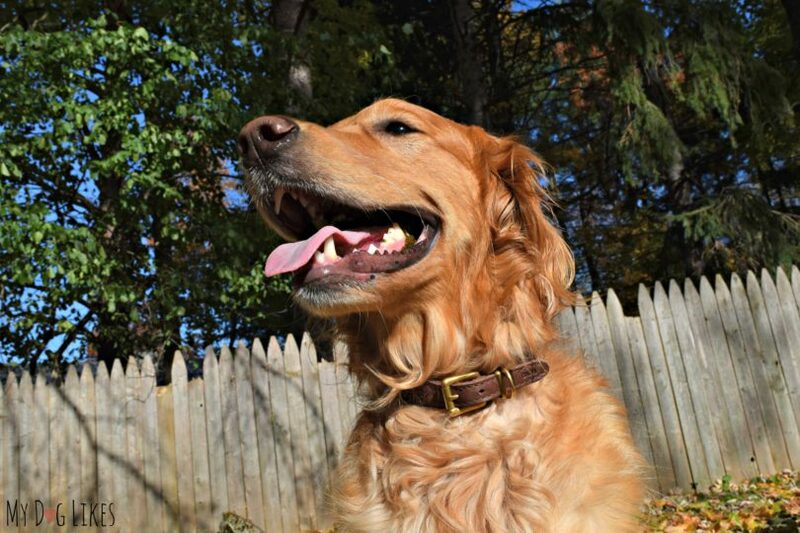 We opted for a sophisticated look, by ordering our “Baldy” collar in the Milk Chocolate color w/ Brass hardware combo. HUND recommends adding one inch to the measurement of your dogs neck for proper fit, and this worked out great for our Charlie. The first thing you will notice about your Baldy collar is how incredibly soft it is. At the same time it is very strong and clearly made to last. Charlie has been wearing his for a few weeks now and just as advertised, we have not noticed any hair pulling or matting in the neck area. Not only that, but it looks fantastic on him! 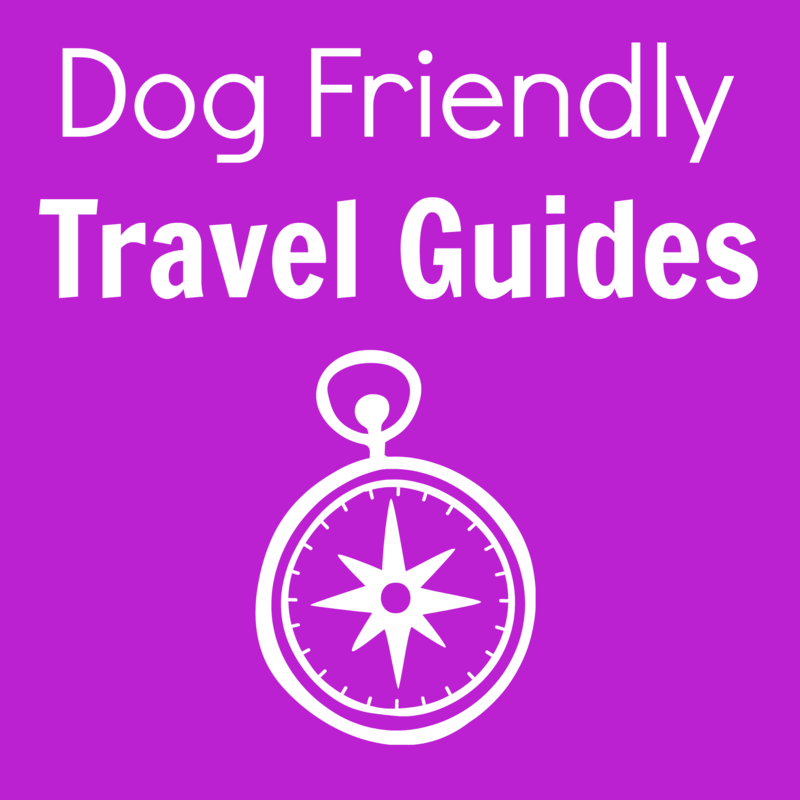 We have reviewed a wide variety of dog leashes on the blog, from standard straight leads, to waist mounted bungee ones, but none quite like this! The Flash leash from HUND is designed to be used in 5 different ways, so you will be covered in any situation! Various attachment points along the leash allow it to be used at 4′, 5′ and 6′ lengths. 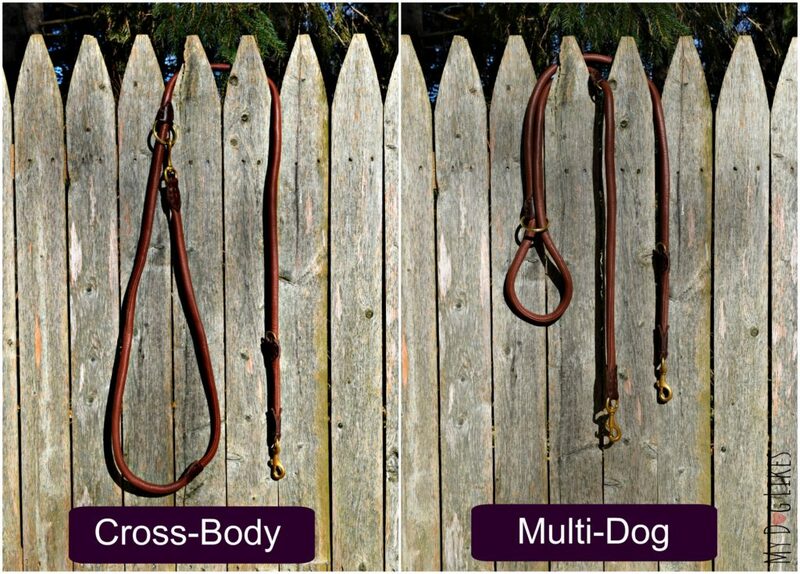 Additionally, it can be set up as a double dog or cross-body lead! 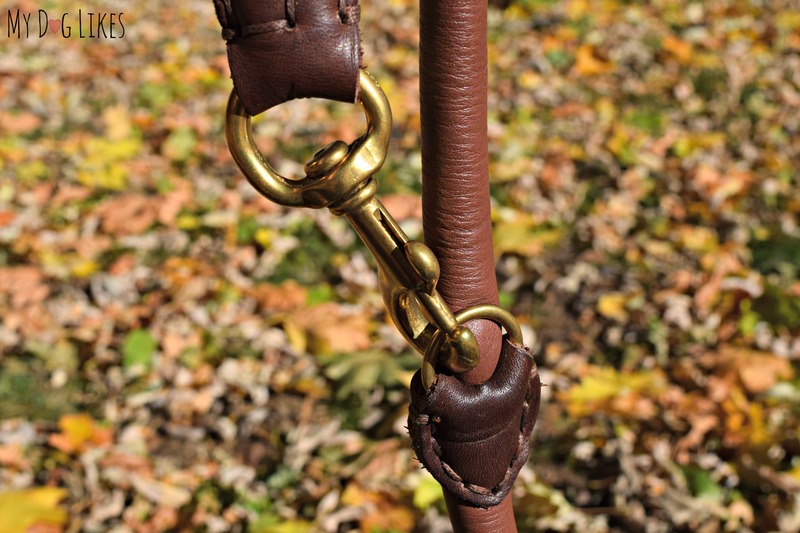 The “Flash” leash is round like the “Baldy” collar and just as soft, making it extremely comfortable to hold onto. 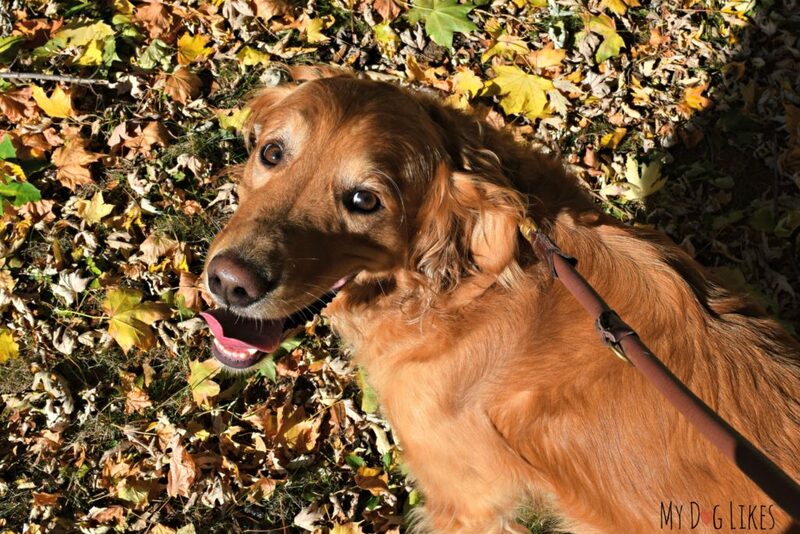 As it turns out, the “Flash” leash even has a nylon core for added strength and safety. We love that their are so many different configurations available and have used it at various lengths and also cross body in order to be hands free while walking. The design of this leash is brilliant, and changing the configuration only takes a few seconds. So whether you are out for a casual walk, making your way through a crowded area, or out for a jog, you will have the perfect gear for the scenario. As we mentioned before, we have had great experiences with the few leather dog products we have tried in the past. Not only are they beautiful, but they hold up amazingly over time. The only concern we have is the ecological impact of leather production. HUND Denmark has put our cares at ease with their line of environmentally friendly leather products. 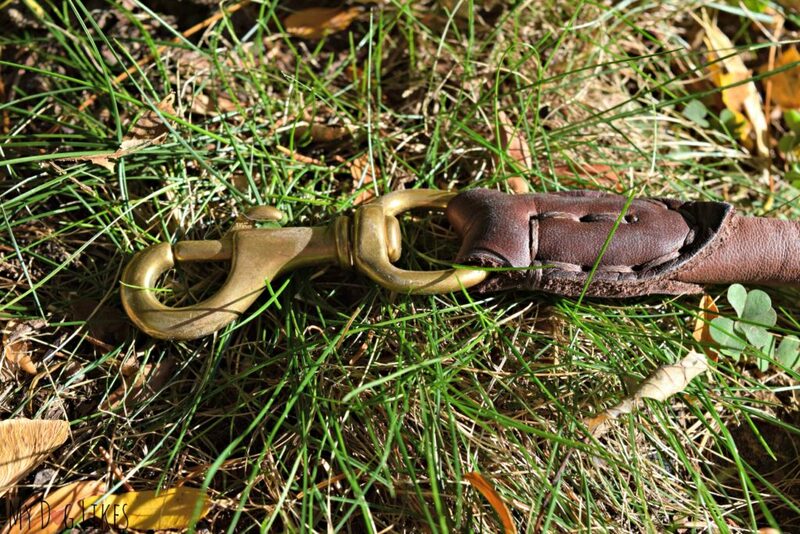 Their wide selection of leather dog accessories use leather processed in traditional ways – using natural plant derived agents as opposed to harsh chemicals. While we clearly love their corporate philosophy, we are just as much in love with the look and feel of their products. 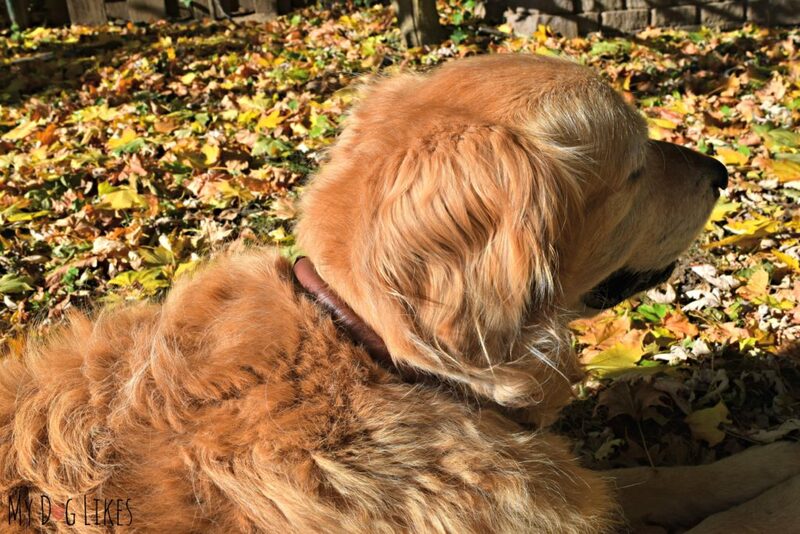 HUND round collars and leashes are RIDICULOUSLY soft, look great, and perform fantastically! 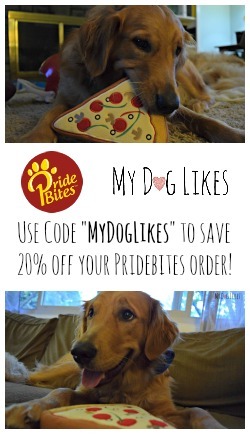 Want to pick up some HUND gear for your best friend? 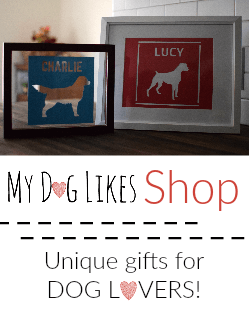 Click here to Browse their Store! Or, enter our giveaway below! Those are definitely European style! My mom isn’t one for leather leashes or collars, she likes the fancy ribbon stuff for us, but these do look great for those who like leather collars and leashes. The Danes always have great stuff. I love versatile products! That leash would be perfect for me in black. The dark brown leash would look awesome against my all-white Samoyed’s hair. the pink and purple FOR SURE!! I love the look and functionality of this leash! The brown leather is just my style! the pink leash! so pretty! I like the red with black details and a brass hook. These look great. Fetch It Case Review - Hands Free, Slobber Free!